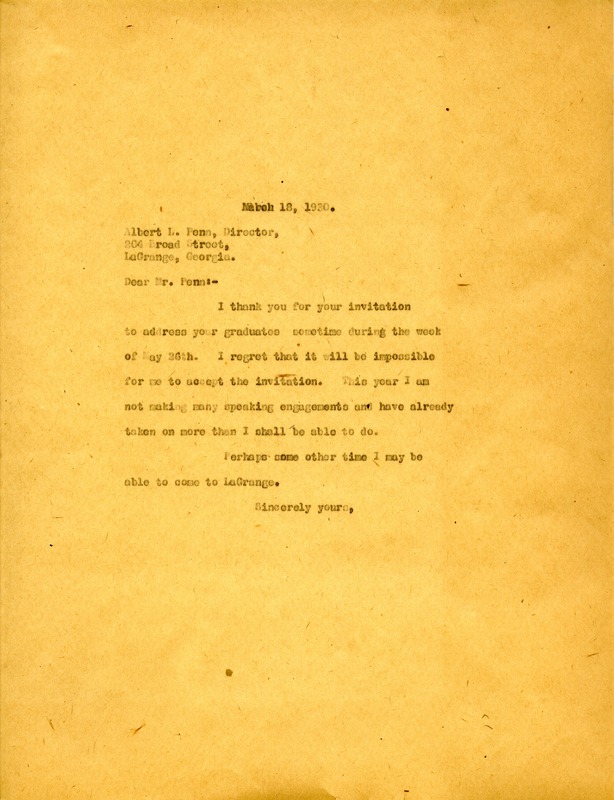 Martha writes to Mr. Penn thanking him for the invite to speak to the graduates. She informs him that she can not accpet the invitation, but perhaps another time she will be able to come to LaGrange. Miss Martha Berry, “Letter to Albert Penn from Martha Berry.” Martha Berry Digital Archive. Eds. Schlitz, Stephanie A., Jordan Brannen, Aaron Jackson, Chelsea Risley, et al. Mount Berry: Berry College, 2014. accessed April 22, 2019, https://mbda.berry.edu/items/show/13686.